The picture was created in 1928. The viewer knows two versions of this picture. On one canvas in front of us, a man and a woman merged in a long kiss. Their heads are wrapped in a white cloth. In another version, they look directly at us. This picture is incredibly symbolic. It contains an incredibly deep meaning. Some critics believe that the plot can be interpreted as the inability of people to reveal the true essence of relationships, even with very close people. The reason for the creation of this picture was the trauma experienced by the artist in childhood (the death of the mother, who decided to jump into the river). The head of the found body was wrapped in cloth. A woman who was beautiful in life did not want to be seen completely disfigured. According to another version, Magritte was fond of the then famous Fantômas. No one knew who was hiding under the mask. The artist chose not to paint faces to show the blindness of love. Lovers are so passionate about their feelings and each other that they simply do not notice anything around. We see a woman and a man at the moment of passion. This can be understood by the characteristic folds of the fabric. Passion just blinded them. They cannot think and notice anything correctly. The artist completely shook the fabric of their heads. The metaphor that people lose their head from love is fully realized here. Another interpretation is possible. This deep feeling is enough in itself. His vision is simply unnecessary. Lovers may not see anything, because they absolutely do not need it. They feel intimate even through two layers of fabric. For a real feeling, barriers simply do not exist. 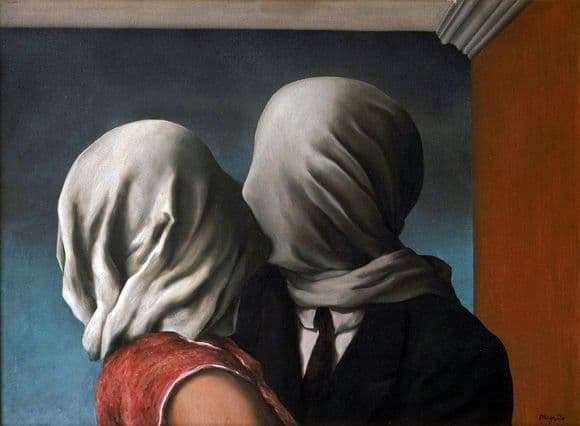 Magritte depicted lovers in the room. This can be judged by the background. If a person is in love, he has inner vision. He begins to feel the world really deep. Lovers can not prevent any obstacles. Magritte wanted the viewer to think.